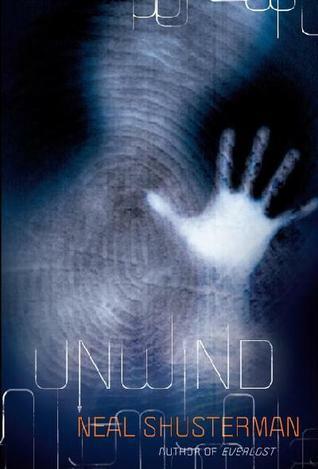 Review: Unwind by Neal Shusterman - Book.Blog.Bake. I paced up and down the hallway while reading the last 30 pages of this book. I had been reading on my bed, got up, and started pacing the hallway because I was so invested. I didn’t even realize what I had done until the last chapter or so. I think that says a lot that I was so drawn into the world of Unwind that I began to be just as anxious for the welfare of these characters as I potentially would for real people. At the core, this book is about the value of a human life, but it touches several other topics. Shusterman doesn’t shy away from hard topics, and he doesn’t let his characters, either. Connor, Risa, and Lev are all asked hard questions and find ambigious answers. The reader is asked to ponder questions, some directly, such as “how do you measure life?” and “what is really the difference between a hero and a villian?” There’s plenty of desperation in this book to go around, let me assure you. The world that’s created is real and frightening. The characterization is deep, subtle, and dynamic. In Shusterman’s world, no hero has completely clean hands and no villian is a caricature of evil, which makes it all the more frightening. Connor is quickly becoming one of my favorite protagonist ever, and it’s because his characterization is clear throughout the story. The premise of the story is a little far-fetched, and at first, doesn’t seem believable, which is the only aspect that had me skeptical of giving this book 5 stars. However, in the book it’s out-righted stated that the “Bill of Life” was meant to be a shocking suggestion to make both sides see how far and wrong things had gone. It was never meant to be taken seriously, but both the “pro-life” and the “pro-choice” sides did take it seriously as a viable solution, and by that point, it was too late to change anything. After reading that, I gave a thumbs-up to the world-building. Another unique aspect of the book is the different points of view. Each of the three main characters are so different from each other and engaging in their one way, though Lev’s thoughts have to be the most intriguing and at times, darkened, thoughts in the book. At various times, we cut away from the main three’s point of view for the chapter and go to someone else, like “The Guard”, or “The Teacher”. I saw a few reviews in which people were frustrated with this format. I think the frustration is understandable, but it’s worth it. Getting all those different points of view just once again outline the fact that the world and situations are complicated. A final note: the creepiness factor in this book is sky-high, and it’s incredibly uncomfortable at times. Even though I thought it was an amazing book, it’s not something I’ll want to pick up again any time soon. A viewing of a insanely happy TV show is highly recommended after reading this. Final Impression: This is such a solid book. Between the characters, writing, plot, and world-building, I was absolutely blown away by the setting and premise of Unwind. 5/5 stars. Another book you’ll love if you liked this one is The House of the Scorpion. It has clones made for organ transplants, but instead of taking place in the U.S. it’s in Mexico, or just north of Mexico, within a drug empire. Definitely read that one. Read it–loved it! Actually, both Unwind and The House of the Scorpion are 5 star reads for me, which probably says something about the kind of books I really, really, REALLY like. I’d love to re-read it thought–it’s been several years since I read it last. Top Ten Tuesday: Top Ten Books I Recommend The Most | Book.Blog.Bake. Review: The Knife of Never Letting Go | Book.Blog.Bake. I’ve been wanting to read this for a long time but it did sound really emotional! So I need to be in the right mood. “A viewing of a insanely happy TV show is highly recommended after reading this.” Yeah when I read depressing books I read something cute, fun, and fluffy right after. But that is is super creepy has me intrigued. And that there is such a fine line between villains and heroes. I think that is realistic because really when you try to do the right thing a lot of times it involves doing the wrong things to get there. It is an interesting topic to explore. It’s a great story! Highly recommend it. Thanks for stopping by & commenting! Completely agree! It dealt with enough complex current political issues to make it relevant without hitting anyone over the head as being completely right or completely wrong. And by far probably the most suspenseful book I read this year.